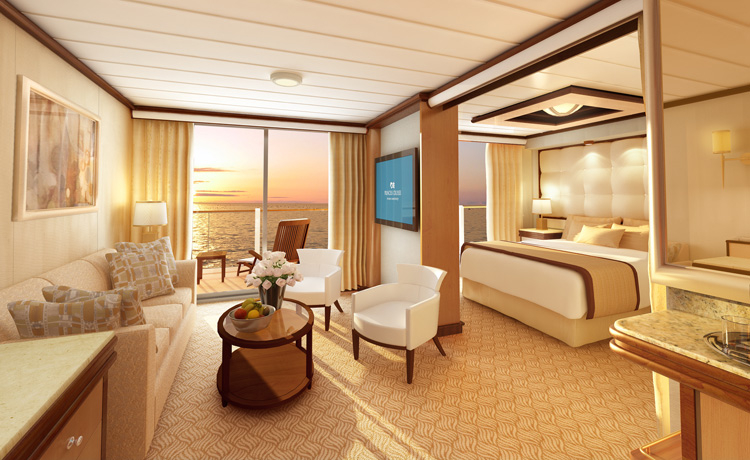 The spacious approximately 222 square foot Balcony stateroom is appointed with fine amenities and outstanding views from an approximately 41 square foot private balcony. Some also have pullman beds to accommodate up to 4 passengers. These features and fine amenities are standard in the Balcony stateroom: Balcony with patio furniture Twin beds that convert to a queen size bed* Private bathroom with shower Shampoo, conditioner, body lotion 100% Egyptian cotton linens Satellite TV, refrigerator, hair dryer, safe, closet, phone and desk 110V, 60-cycle alternating current (AC) with standard U.S. plug fittings Daily housekeeping service Evening bed turn-down, chocolates on your pillow *Due to some cabin configurations, the two twin beds may not convert to a queen size bed.